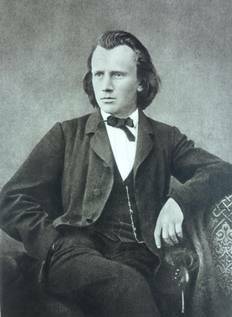 The Requiem of Brahms was, for me, the first work that I studied extensively and which gave to me an internal foundation of what to do in music to make it cohesive and spectacular. To this day, over 65 years later, I judge internally the function of an individual phrase, the balance of one movement to another (and against the whole), the harmonic function, the rhythmic suitability of a particular phrase, all are grounded and haunted by this seminal work of theory, craftsmanship and emotion. The religious implications are essentially irrelevant, the biblical verses mere guideposts – this is music making of the highest order! Selig sind, die da Leid tragen Hearing the beginning of this magnificent piece was striking as the celli began the rather dark theme and were then echoed by the violas. Brahms wrote no parts whatsoever for the violins in this movement and the shadowy coloration was extremely effective. Denn alles Fleisch, es ist wie Gras is the movement closest in mood to the Schicksalslied. This is often an ensemble’s undoing and today the choir took the hit. There were many wrong notes – sometimes echoed by the horn section – and the louder notes tended to be out of tune. This is no easy task for the singers, but that is no excuse for so many screeches. Herr, lehre doch mich There was something wrong with Mr. Goerne this day. Not only did he botch his high notes, but he seemed out of sorts. Watching him when he was not performing, he looked physically ill.
Wie lieblich sind deine Wohnungen is sometimes excerpted (in English) by American congregations that feature their choirs. LOVELY!! A myth surrounded Ihr habt nun Traurigkeit for quite some time, leading even well-recognized historians of musical composition to expound on the overflowing emotions that affected Brahms after his mother died, except for the pesky fact that the bulk of the movement was written about two years before this sad event took place. This hyperbolic “scholarship” in no way undermines the function of the movement as the balancing interval of loving-kindness in the midst of such powerful Sturm und Drang. Tending to obfuscate the situation was Ms. Fang, who appeared and sounded simply too young to capture the role. She is no Jessye Norman. Denn wir haben hie keine bleibende Statt expresses its kinship with the second movement. One of those extraordinary Brahmsian fugues leads to expressions of intense ensemble power. Again Goerne was indisposed in some way, He did not roll his “r”s and seemed only interested in getting off of that stage. We were eventually rooting for him to do so. Just a bad night I’m sure. Selig sind die Toten This movement went off without a hitch and painted a mirror image of the opening as a pastoral farewell. Movements 1 & 2 foreshadow sections 6 & 7. Fearful symmetry.